Do diurnal changes in fuel moisture conditions bound the burn period each day, excluding much of the evening, overnight, and morning hours? If the answer is yes, consider primarily Low Moisture of Extinction fuel models over High Moisture of Extinction models. If specific fuelbeds seems unaffected by greenup and summer conditions, consider primarily dead fuels only fuel models during those periods. Consider what is carrying surface fire (Grass & Grass/Shrub, Shrub & Timber Understory, Timber Litter, or Slash/Blowdown) and select several alternatives. Dynamic Fuel Models (marked with *) allow greater variability due to seasonal transitions in live fuels. They are concentrated among the grass and grass shrub models primarily, due to the annual greenup and curing they experience. Note that SH1, SH9, TU1, and TU3 also include herbaceous fuel loads and are dynamic. Low, Moderate, and High classifications within each group reflect relative Heat per Unit Area levels. Use this classification to help focus selections on several alternatives. Once several alternative fuel models have been selected as possibilities, evaluation of their fire behavior outputs (rate of spread and flame length) with typical or reference inputs is important. However, making several good fuel model selections is only a preliminary step in the calibration process. As suggested here, when comparing modeled and observed fire behavior, it may be helpful to think of spread rates and flame lengths in ranges or Fire Behavior Classes. If fireline personnel can effectively report observed fire behavior in these terms, differentiating what they see through the burn period and as environmental inputs change, the analysis will be improved dramatically. Testing the range of a fuel model’s characteristic fire behavior requires analysis of several environmental inputs. Consider these. BehavePlus, as a sensitivity tool, only allow consideration of two variables at a time. However, there are generally at least 3 significant environmental factors that govern the day-to-day variation in fire behavior; wind, slope, and fuel moisture. Fortunately, the Rothermel fire spread model depicts the effect of slope as an equivalent wind speed. If the calibration analysis represents the wind speed as a range of effective wind speed, slope should be at least generally incorporated. In some cases, it may still be necessary to consider its effect separately. 1hr Moisture & Effective Wind Speed: The dominant factors wind, slope, and fuel mois Once a range of expected midflame wind speeds is established, it is possible to add the effect of slope by identifying the slope equivalent wind speed, producing a range of effective wind speeds for the calibration analysis. 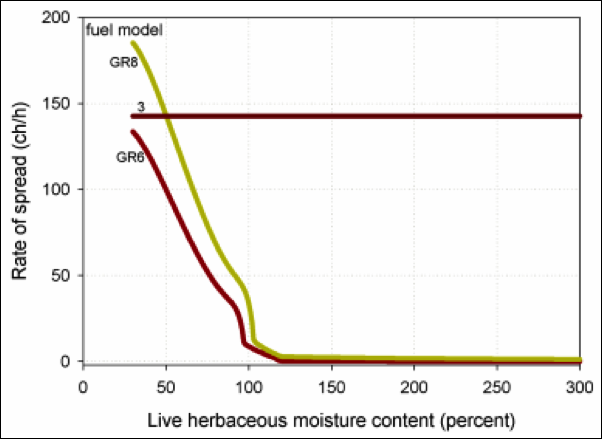 Live Herbaceous Moisture: With other environmental inputs set at representative levels, evaluate the range of fire behavior produced between 30% and 120% live herbaceous fuel moisture for dynamic fuel models. 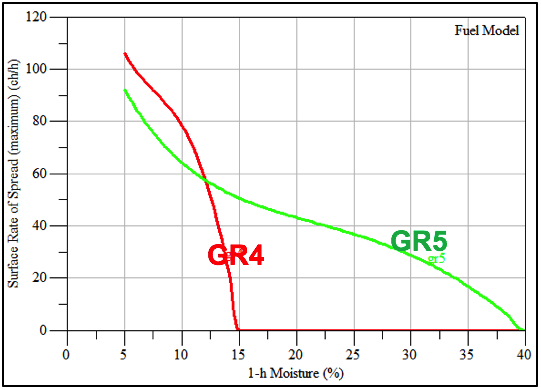 Live Woody Moisture: This consideration is critical for grass/shrub, shrub, and timber understory fuel models. Because there is no fuel load transfer in the live woody category, default ranges are characteristic of the current season. Set other environmental inputs at representative levels. Keep in mind that live woody moisture levels change rather slowly in most cases. Depending on the time of year and the drought situation, it may not be necessary to consider a wide range of moistures. However, it is critical that appropriate levels are identified for the analysis. Slope and Spread Direction: Though this combination of factors is probably secondary in most cases, backing and flanking fire behavior related to slope reversals and prescribed fire ignitions may be important. This guide integrates the original 13 models with the 40 standard models added in June of 2005. Though the developers of the 40 standard models intended that they stand alone, all 53 models are available to the user in current versions of all the fire modeling systems that are designed to use them. And though the original 13 models were grouped into only 4 carrier types, they can be effectively distributed into the 6 types defined with the newer set. Consider the objectives that guided the development of these two sets. Wildfires under peak fire conditions with cured herbaceous fuels. Sensitivity to live fuels is represented in only 5 of them, with large responses predominately in fuel models 4 and 5. They were designed before crown fire modeling was implemented, requiring that at least some of the 13 (fuel models 4, 6, and 7) represent crown fire behavior.See Active Crown Fire Behavior page for more information. Facilitate analysis for fire use and fuel modification treatments. They are designed so that they can represent green, growing season conditions as well as cured, peak season conditions. The most important benefit of integrating fuel model sets in this guide may be the context the original 13 provide for users familiar with them. Consider it something of a dual language guide, facilitating translation for those users. When selecting a fuel model, one of the first considerations should be whether fuels are expected to burn under high fuel moisture conditions. Though many modeling tools allow the user to define a burn period which can truncate fire behavior even when moisture of extinction has not been reached, humid climate fuel models (with high moisture of extinction) will express significant fire behavior even when corresponding dry climate fuels estimate no fire spread. The example here demonstrates that GR4 exhibits no fire spread at 15% fuel moisture and at that same point, GR5 can project spread rates of as much as 50 ch/hr. Ensure that the fuel model selected accurately represents potential fire spread and intensity under the range of fuel moistures conditions that will be encountered. To ensure accuracy in modeling efforts, fuel model selection needs to employ a disciplined process. With the addition of 40 fuel models representing six carrier fuel types, users will be more likely to find an appropriate fuel model based on fuel model parameters, resulting in reasonable ranges of fire behavior over the range of anticipated environmental conditions. Looking at the fuel bed, what fuel type (GR, GS, SH, TU, TL, or SB) is observed, or expected, to carry fire spread? Keep in mind that there are analogous characteristics that can cross these fuel types. However, if your fuelbed has a significant canopy layer, it may be more descriptive to select a TU or TL fuel. Which fuel categories (1hr, 10hr, 100hr, Herb, Woody) are observed, or expected, to be available for burning in the flaming front under anticipated range of environmental conditions? Does one or several represent the distribution of fuel loads better than another? Is it a shallow or deep fuelbed? Will any shrub layer burn as part of the surface or canopy layer? Is the fuel model description a reasonable description of conditions encountered? A feature that was implemented with the development of the National Fire Danger Rating System (NFDRS) recognizes that most herbaceous fuels transition between green and cured conditions over the course of a fire season. The transfer of herbaceous fuel loads between live and dead categories redefines the fuel complex with each proportion transferred, making it a critical fuel model characteristic. The changes in output fire behavior can be dramatic when compared to the static fuel models among the original 13. The example here shows spread rate for dynamic fuels GR6 and GR8 with the corresponding static FB3 from the original set of 13. In the development of the new set of fuel models, this dynamic or proportional fuel load transfer has been implemented for all fuel models that include herbaceous loads. 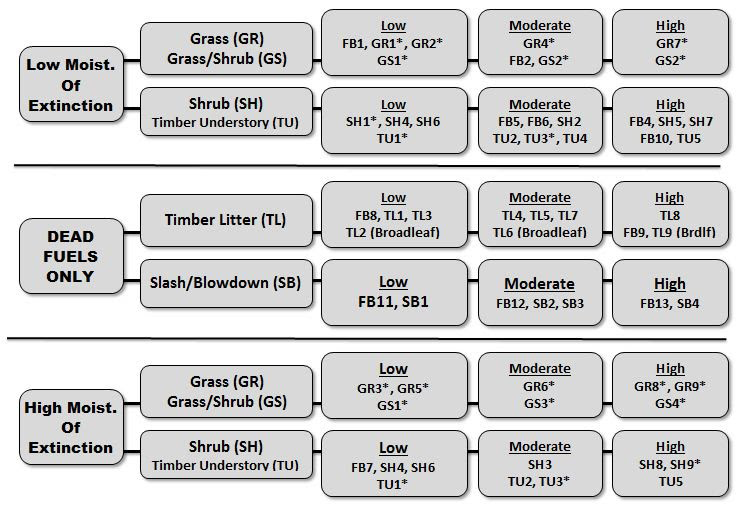 It includes all grass, grass/shrub, two shrub (SH1 & SH9), and two timber understory (TU1 & TU3) models. As depicted in the graph and table below, the fuel load transfer (implemented in FARSITE, FLAMMAP, and WFDSS Fire Behavior analysis tools) is dependent on the input herbaceous moisture content. 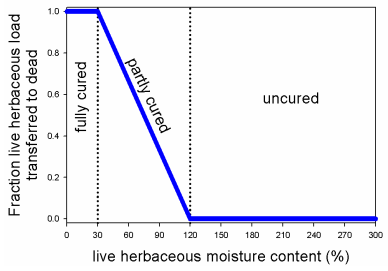 If input Live Herbaceous Moisture Content (LHMC) is 120% or higher, none of the load is transferred. If input LHMC is 30% or lower, the entire load is transferred to dead herbaceous fuel and the 1hr moisture content is assigned to it. Important cautions: Between 90% and 100% input LHMC, very rapid changes in fire behavior outputs can occur. Be sure to test the sensitivity to this input. Though it is agreed that live fuels can provide a critical influence on fire behavior, serving as both the heat sink and heat source in varying combinations, the specifics are not well modeled or understood. There are findings that indicate that curing is not directly related to herbaceous moisture content. As a result, BehavePlus allows the user to input curing % separate from LHMC.